The heavy lifting of the HCHR campaign is carried out by organizing committees comprised of volunteers who are willing to help lead this movement by mobilizing people in their local communities. We’re working to develop organizing committees across the state. 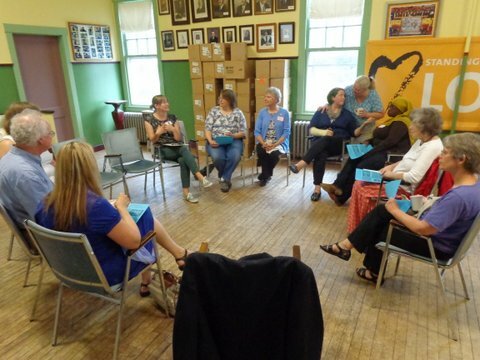 We have active Organizing Committees in Lewiston/Auburn, Greater Portland, and Biddeford/Saco. If you live in one of these areas, join us! If you live elsewhere contact us to start a new Organizing Committee in your community. The HCHR committee is available to lead interactive presentations to groups across the state who are interested in learning more about how to support the movement for truly universal, publicly-funded health care in Maine. This is a great way to engage people within your network and to increase the reach and power of the campaign! We can develop customized presentations to suit different time constraints and group sizes. If your faith community, book club, community organization, or workplace is interested in arranging a presentation, please contact us. It’s important for us to amplify the voices of ordinary Mainers who have experienced the consequences of our current for-profit system and believe we need a change. Regular letters to the editor, op-eds, and other media strategies are crucial for keeping HCHR a current issue in public discourse and inspiring new people to join the campaign. SMWC organizers are available to help folks interested in sharing their stories to craft LTEs.